Ben Hilfenhaus is a man of few words, so to hear him speak passionately of a desire to avoid a third consecutive Ashes defeat is to gain a rare glimpse of the Tasmanian's drive. A valiant performer in England in 2009 but a less illustrious one in Australia in 2010-11, Hilfenhaus let his usual public guard down when casting his mind forward to 2013. Having reconstructed his bowling action and added diversity to his approach following a horrid tilt at England last time around, Hilfenhaus is now a valued part of Australia's Test side. He is a more peripheral character in ODI cricket, as demonstrated by his sitting out the first two matches of this series. Nonetheless, Hilfenhaus has found reconnaissance value in the trip to England, and two defeats have clearly stirred up the pain of previous Ashes encounters. "I definitely think we've got unfinished business," Hilfenhaus said. "I've lost two Ashes series now. I definitely don't want to be a part of a third losing one that's for sure, and I think there are a lot of blokes who feel exactly the same way. I'm not looking too far ahead at this stage, but it will be a pretty big series for us. "You always love to beat the Poms. We didn't have the ideal start to the one-day series and I think in the last two games of the series we're definitely going to show them what we are made of, that we are the No.1 team in the world. It's nice to be playing in these conditions and get a feel for them again, and just have a little reminder of the things we need to work on." Accompanying Hilfenhaus and the rest of Australia's bowlers on the tour is the Tasmania bowling coach Ali de Winter, a contender for the full-time role vacated earlier this year by Craig McDermott. Hilfenhaus and de Winter have developed a rich understanding over the years and, after McDermott identified several problem areas following the last Ashes series, de Winter was the man to put his bowling action back together, with the aid of extensive fitness and strength work following two years of knee niggles. "He noticed my action had changed a little bit and realised what we needed to change to get back to where we wanted it. 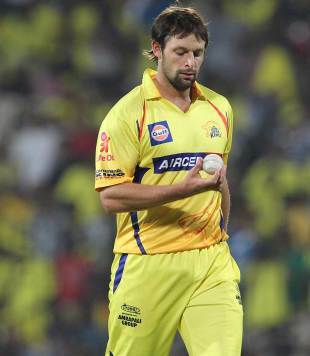 He definitely played a very big role in that," Hilfenhaus said. "I had a bit of time off and got the body strong again and slowly worked on it, and still will continue to work on it every day to make sure old habits don't creep back in. "I find the body is weird. Just about every fast bowler's got niggles and whatever else, but in my case my action changed a little bit because of that, without me ever knowing. That was a bit of a wake-up call to keep an eye on those things, to make sure in the future it doesn't happen again." Waqar Younis is another authority on fast bowling to have raised his hand for the Cricket Australia job, and like McDermott would offer a wealth of knowledge derived from bowling in Test matches. De Winter's path to the same job is rather different but Hilfenhaus said his mentor was as adept at tactical advice as technical tweaks. "I personally find that he is very good technically to me, he understands the way I bowl pretty well, and he picks up things really easy," Hilfenhaus said. "Tactically he is very good as well, but for me personally it is more the technical side of things. I am sure he is having a look at everyone else's actions as well and trying to find ways to help them improve. "If I am doing things technically correct, that will help my chances at the other end, and some other people might be different. Some people need to be told all these tactics about bowling and these sorts of things, someone like myself I need to be told to keep things technically correct to give myself the best chance to perform my skills. "I rate Ali pretty highly and I'm sure once the other blokes have had a bit more to do with him, they'll say exactly the same thing." George Bailey, the Tasmania captain and a fellow England tourist this year, has said that Hilfenhaus has at times needed to be convinced of change being worthwhile in order to carry through with it. In the past 12 months he has done plenty of learning, including a successful stint in the IPL, and so far is reaping rewards from a more open-minded approach. "To be honest I do like staying in my comfort zone a little bit, I like sticking to the things that I know work," Hilfenhaus said. "I still have a few things to prove in the shorter form of the game, I'll keep chipping away and hopefully my skills can get to the stage where I'm a permanent member." A permanent member of the one-day team, and an Ashes winner, perhaps.